Here comes the roundup for CWS Event hosted in my space. Need to thank Priya of Priya's Versatile Recipes for giving such a nice opportunity. 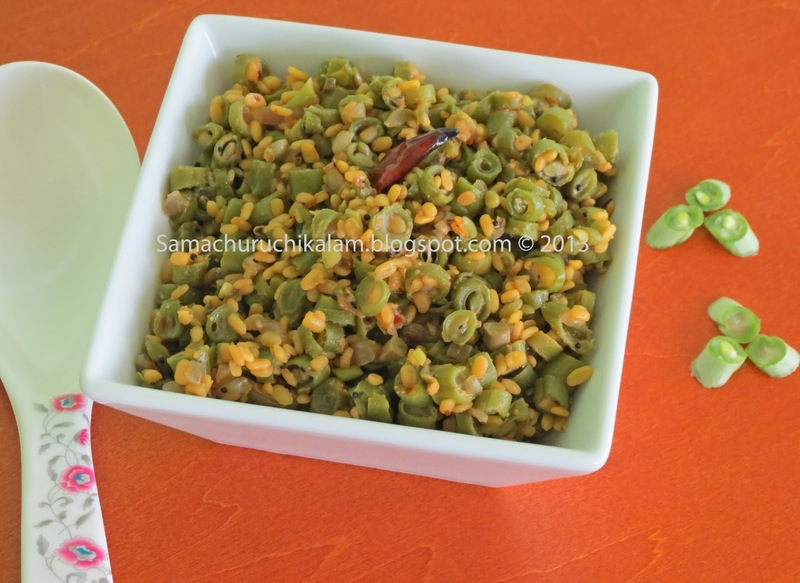 I got around 20 different recipes based on yellow moong dal, It was nice to know some new recipes through this event and its time to thanks for all participants for sharing recipes here. First I need to thank all the participants for making last months WTML a great success. I need to thank Gayathri of Gayathri's Cook Spot for giving such a nice opportunity to host here Event Series. Here comes the list of entires. Gayathri selected a winner through random number generator, and the lucky winner is Priya Suresh of Priya’s Versatile Recipes for Amarnath Leaves Stir Fry. Congrats Priya, please email your India contact information to gayathri for receiving your gift. Once again thanks for all my participants and friends to made this event a grand success. Hi friends, I know it’s been longtime didn’t get a chance to write in my space. Oh! Its vacation time, after enjoying three weeks of vacation, now me and my kids are in lazy and tired phase still we need set our routine life. When we plan to cook we use to make dishes according to our mood and energy, hope most of you will accept this. Due the laziness yesterday our lunch was very simple to give a healthy twist tried this Beans Moong curry. 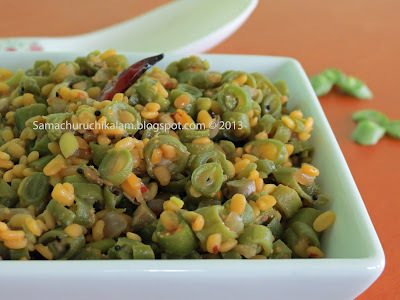 Dry roast moong dal until it leaves nice aroma and soak that in water for about an hour. 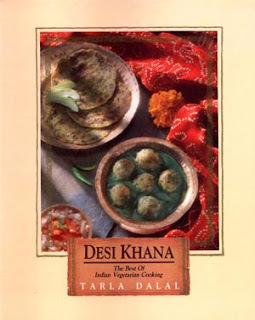 In a kadai, sauté mustard seeds, dry red chilies, curry leaves and onion for 2 – 3 minutes. Then add chopped beans and fry for couple minutes now drain the water from dal and add moong dal to fried beans and add enough water and salt. Cover with a lid and cook until beans and dal is cooked well. This is my first host event, feeling so happy need to thank Priya who is writing at Priya‘s Versatile Recipe for giving such a wonderful opportunity. Most of you might know about this event, priya was conducting this for past three years. As the name says Cooking With Seeds we use to select one seed per month and using that seed ad main ingredient we need to prepare our dishes and summit here. In Indian cooking Seeds or Legume or Lentils play main role in our each meal, I need to say without this our meal never completes. This month I choose Yellow Moong dal which is nothing but skin removed split mung beans. Yellow Moong is a good source for protein and dietary fiber; it’s also rich in potassium, B complex vitamins and calcium. One more thing is it’s easy to digest when compared with other lentils. It’s always good to start yellow moong for infants first. If your cooking with Yellow moong anything from soups, stews, rice, etc.. to ice cream and desserts, don’t forget to share in this event. 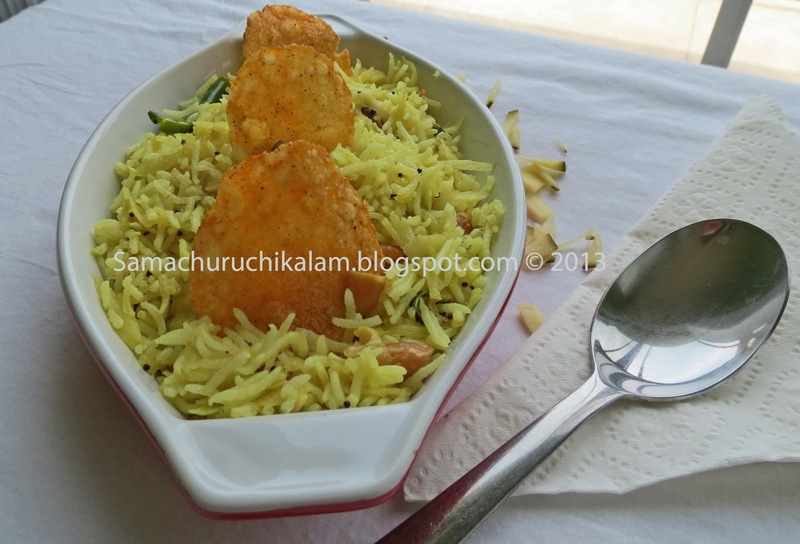 You can use Yellow moong in any form (whole, crushed, powdered, etc. ), you can cook, bake or make any dishes (vegetarian, vegan or Non vegetarian). Many entries per person are allowed. Use of logo is appreciated because it helps to spread the word. Use logo and add announcement links for the archived post and repost it we will accept archived with these changes. Use the linky tool for sharing your recipe in this event. Event starts on July 1st and ends at July 31st. 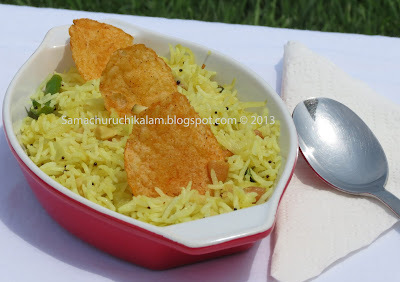 Due to some issue in my linky tool its not working, so please share your recipes through my email manju.ju@gmail.com I will add them in roundup. sorry for the inconvenience. Here comes my next event for this month, Need to thank Gayathri who is writing under Gayathri’s Cook spot for past 2-3 years. She got such a lovely blog with vegetarian recipe and mostly with step by step pictorial explanation. Walking Trough the Memory Lane is started by Gayathri in January 2012 and each and every month she gives a chance for co bloggers to host this event this month it’s my turn. Such a lovely topic, as soon as I saw the name I fall in love, because this event take you to the childhood, Yep you can cook and post what all food you learnt from you Mom, Dad, Grandma, Grandpa, Aunty, Uncle etc.. With a short story related to that dish in your life. I usually post every month at least one or two recipes for this event. One good thing is Gayathri will select an entry through random selection and give away the book for the selected entry. Note that books Gayathri gives are not sponsored and it’s her own contribution to the event. While posting the recipe give a link to this page and Gayathri’s Announcement page. If you are linking an archived entry, please update it the link to this page and Gayathri’s Announcement page. Two entries from the archies are accepted. Non-Bloggers can also send in their entries by mail to manju.ju@gmail.com . I will include it in the round up. Please like our Facebook Pages and follow us through GFC. Use the linky tool below for sharing your recipe in this event. On the first of August, Gayathri will select a lucky winner and send a mail. After receiving her mail, you can give an address to which she needs to ship the book. She will ship the book within India so if you reside abroad, please give an address in India for her to ship. I request all my readers to help me in making this event a huge success. Green is one of the pleasant colors for eyes, when it’s coming to cooking with green there are lot of vegetables available in green. Even we use to refer leaf vegetables as greens, which are healthy ones. Hope you might have found today’s color right now, Yep its green, I choose green mango as main ingredient but the final result is yellow. Peel the skin of green mango and shred it. 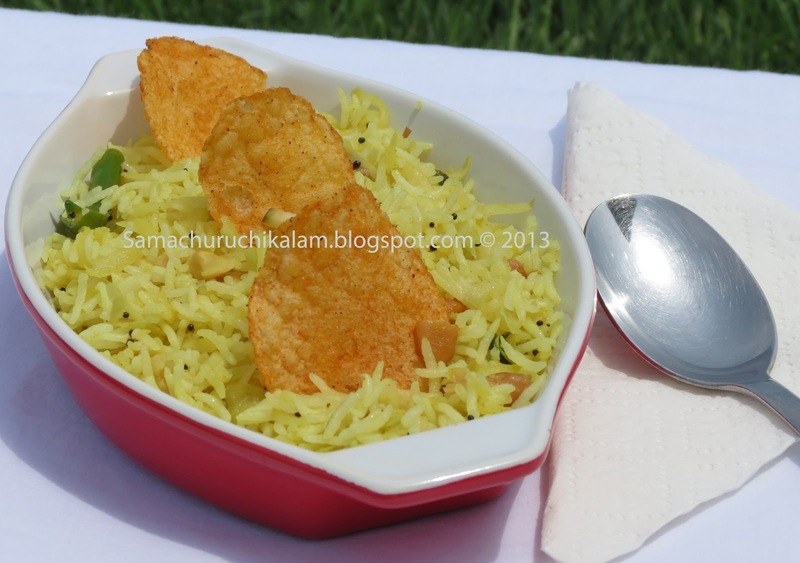 Once the rice is cooked spread that in a large bowl and allow cooling. Heat oil in a kadai, splutter mustard seeds and asafetida then add split chana and urad dal saute for a minute. Next add green chilies, cashew nut and peanut when they start to turn brown add turmeric, curry leaves and cilantro (half portion). Saute for few more seconds and add shredded mango and salt, give a nice stir and turn of the stove. Then add cooled rice and mix well. Garnish with remaining cilantro and serve it hot with chips. Mango should be very sour then only you can get good flavor in rice.